The twenties played a seminal role for women's emancipation. It's not suprising that Vive Maria expanded dandyism to the ladies. This beautiful and comfortable nightdress is made of a pleasant cotton modal material mix. It has 3/4 long sleeves, which end in a lace cuff. The front shoulder area and the neckline are also decorated with lace. In the décolleté area there is a small peephole with a small black and white satin bow. An underbust seam ensures a good fit. The lower hem ends in white lace. The nightdress has a loose fit that accentuates the feminine silhouette. The sleeves have horizontal pinstripes, the upper part has diagonal pinstripes and the skirt part has vertical pinstripes. 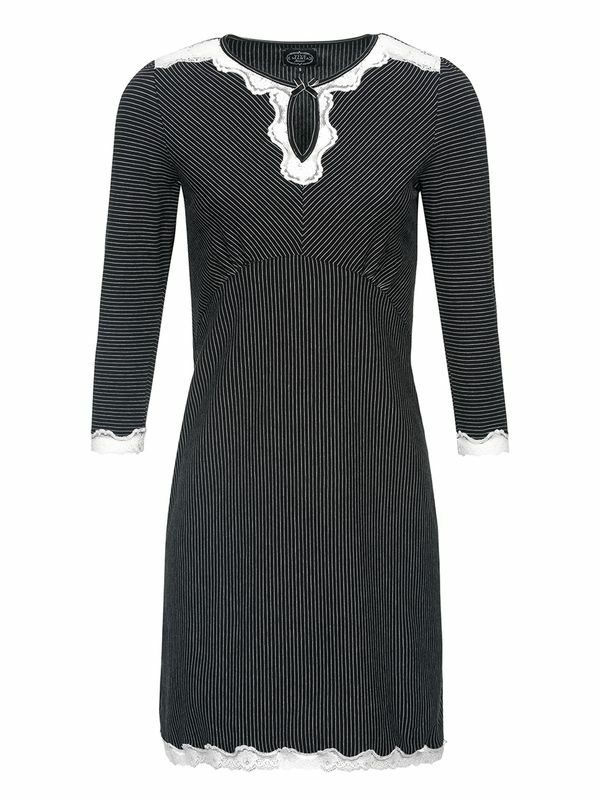 Black pinstripe with lace just looks simple and elegant. For Vive Maria, it doesn't matter whether it's nightwear or outerwear. The beauty of women is our focus - no matter what the occasion. If this nighdress isn't elegant enough for you, please have a look at our Dandy Nights negligée.